As of today, my husband and I have walked the same path for 18 years. We’ve gone through the childhood of our relationship, those awkward middle years, the teens. Together we’ve run through open meadows, plodded through dark forests, meandered along the well-worn path of daily existence. Most often he is slightly ahead of me, not because he’s leaving me behind, but because I am the daydreamer, always stopping along the way to smell a flower, take a picture, dream a little, and he is the more practical one, walking to get from point A to point B. But if I get too far behind, he waits for me to catch up. Other times, we walk hand in hand, slowing down a little, taking it all in, together. He’s into sports and I am an artist, and of course, we are both many things in between. 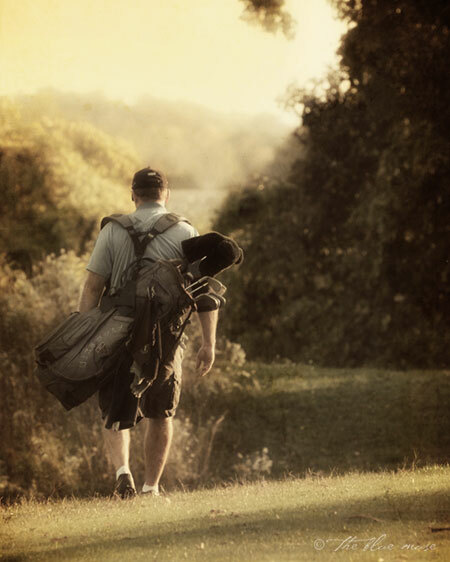 It may seem an unlikely combination, but it works for us, his golf is his art, my art is my sport, and there is room on this path for both of us. There are picnics and campfires, storms and sunny days, seasons that change and stay the same. Blisters from too much walking, silence after too much talking, and moments when no words are necessary. He’s always there, on my horizon. We watch the sun set, the moon rise, the sky fill with stars. In the darkest hours of night I listen to him breathe. Coyotes call, and in our sleep, we both smile. many more years of toe touching, kelly! this is wonderful and i can feel the truth and love and real life day to dayness behind it. happy anniversary, mr & mrs, m.
Happy, happy anniversary. May you know many more years together, on your path of dreams. Happy anniversary! I wish you many many more ! Happy anniversary and the very best of wishes to you both.